Tickets On Sale Now for Maddie and Tae Fair Grandstand Show! Online ticket sales are now available for the Friday night grandstand show at the 2019 Lassen County Fair! 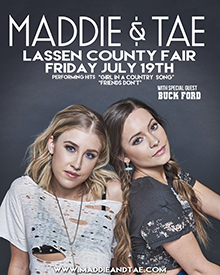 The concert will feature platinum-award winning country music duo Maddie and Tae at the fair’s annual Country Night show July 19th. Opening for Maddie and Tae will be country music sensation Buck Ford. Reserved and box seating for the concert is $25 to $30, Festival Area seating is $35 and General Admission tickets are $20. 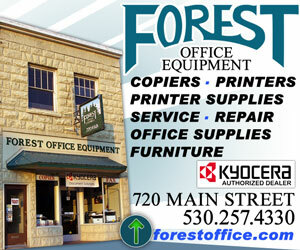 Click here to purchase the tickets online, or stop by the Fair Box Office on Russell Avenue in Susanville. The pair, from Texas and Oklahoma, respectively, wrote and performed all eleven tracks on their Dot Records debut album called Start Here. Their debut single, Girl In A Country Song, was a platinum-certified breakout hit that soared atop the Country radio charts. Maddie and Tae are only the third female duo in history to peak their debut single at #1 on the Billboard Country singles chart. The video for the song garnered over 38 million views and scored the duo their first-ever award, a CMA Video of the Year. The pair also swept the 2016 Radio Disney Music Awards, winning both Favorite Country Artist and Favorite Country Song for GOLD-certified Fly. They have previously been nominated for ACM, CMT and CMA Awards. Receiving critical acclaim from NPR, Entertainment Weekly, The Washington Post and Glamour, among others. Maddie and Tae have appeared on the Late Show with David Letterman, TODAY, The Tonight Show Starring Jimmy Fallon, Live! with Kelly and Michael and most recently on The Talk, where they performed a cleverly written tune about dealing with bullies called Sierra. Posted by Jeremy on . Filed under Announcements, Local & Regional News. You can follow any responses to this entry through the RSS 2.0. Both comments and pings are currently closed.